Yes that's right, someone actually wants to marry little old me, if not only for the fact that I can cook a mean lasagne and know how to work a washing machine. But nonetheless, I will at some stage in the future have a wedding to plan. An actual wedding! Despite only being 22 (with the mental age of a 2 year old, mind) I could be a wife sooner than I ever thought! Not like I'd be the first though, everyone seems to be skipping down the aisle and popping out sprogs like its going out of fashion these days...I'll definitely be leaving the latter for a good couple of decades yet though. I don't quite feel old enough yet, and having just received a text from my delightful other half informing me that he is first in the queue at ASDA to get the new Fifa at midnight release- neither does he! Regardless of our immaturity though, I cannot help myself but spend my days reading countless wedding blogs and pinning cute little invitation ideas to my pinterest (oh yes, I'm going to be one of THOSE brides). But the main thing on my mind? THE DRESS. Not really bothered about any other details but my wedding dress. I could be getting married in a field full of pigs, but as long as I had the dress of my dreams on, and my man at my side (had to!) then I'd be a happy wife. 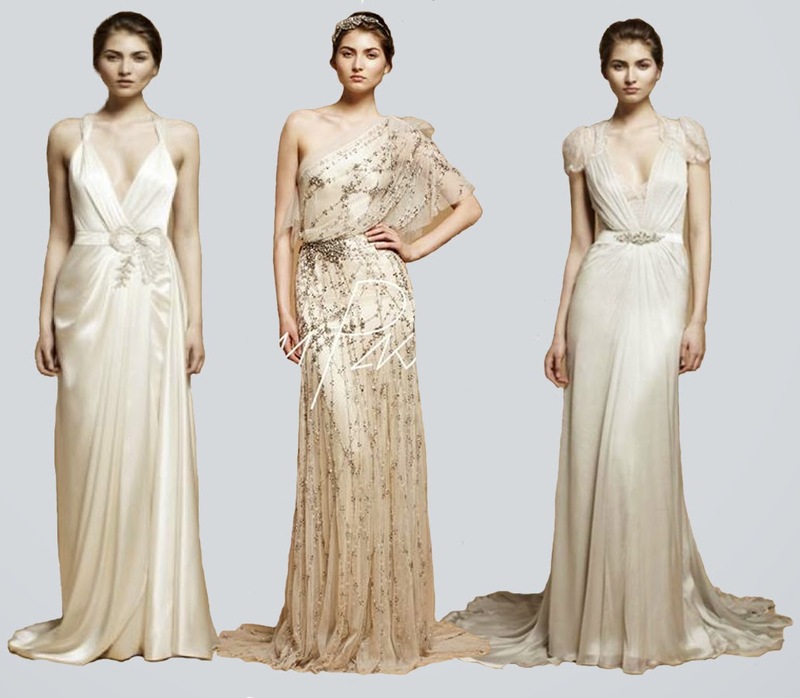 My first love of bridal designers has got to be Jenny Packham. I'm a self-confessed old lady at heart and I love anything vintage with a glamorous Great Gatsby-esque twist, so good old Jenny would be my ideal choice. I love how timeless her dresses are, and I could picture myself in any one of them, stood at the alter on the happiest day of my life! My three ultimate faves are these gorgeous things, and I would have to sell my soul on ebay to be able to afford one, but a girl can dream right? With wedding fever in full swing (yet no actual wedding date set, whoops), I'll be bringing you so many more of my ideas and inspiration on the road to the big day! Thankyou! My pinterest is going crazy with wedding ideas! Wow thats very exciting ! Jumping on the blogging bandwagon...at last!